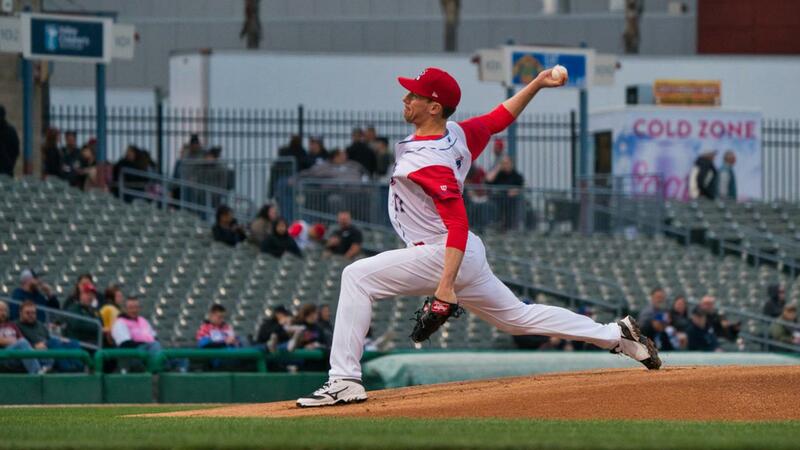 STOCKTON, Calif. - The Stockton Ports offense came out of the gate hot to open the 2019 campaign. Stockton scored four runs on three hits in the bottom of the first, including a two-run homer by Jeremy Eierman, on its way to a 4-1 Opening Night victory over the Rancho Cucamonga Quakes at Banner Island Ballpark. Quakes starter Leo Crawford (0-1) issued a leadoff walk to Nick Allen in the first and Lazaro Armenteros followed with a double to right to put two aboard. Two batters later, Alfonso Rivas knocked a two-run double to left that scored Allen and Armenteros and gave the Ports a 2-0 lead. Eierman followed with a two-run homer to left that doubled the Ports lead to 4-0. Crawford suffered the loss, going two innings and allowing four runs on four hits while walking two, hitting two batters and striking out five. The Quakes bullpen, a combination of Victor Gonzalez, Sven Schueller and Wes Helsabeck, combined to shut out the Ports over the final six innings while allowing just one hit in that span. Meanwhile, Oakland A's right-hander Chris Bassitt opened the game for Stockton on a Major League rehab assignment and showed no ill effects from his right leg contusion. Bassitt spun three perfect innings while striking out seven, including the first five batters he faced. He threw 47 total pitches, 30 for strikes. Daulton Jefferies (1-0), who nearly two years ago was shut down while with Stockton to undergo Tommy John surgery, made a triumphant return to Banner Island Ballpark as he followed Bassitt into the game. Jefferies retired nine of the 10 batters he faced over three strong innings and notched four strikeouts in earning the victory for the Ports. Jared Poche came on to start the seventh and gave up Rancho Cucamonga's only run in the eighth on an error. With Devin Mann at first base and one out, Brandon Montgomery hit a ground ball to the shortstop Allen. Allen, attempting to throw to second base for the force play, threw wide of the bag and the ball went into right field, allowing Mann to score and putting the Quakes on the board. The run was unearned for Poche. Poche came on to start the ninth and issued a leadoff walk. Carlos Rincon followed and reached on an error, a dropped fly ball in right by Eierman, which brought the possible-tying run to the plate. Poche would strike out Deacon Liput and then be lifted for Trey Cochran-Gill (SV, 1), who induced back-to-back groundouts to end the contest and notch the save. The Ports and Quakes play the second game of their four-game set on Friday night at Banner Island Ballpark. Right-hander Brady Feigl makes his California League debut for Stockton, opposed by Rancho Cucamonga right-hander Edwin Uceta. First pitch is set for 7:10 p.m. PDT.